Scientists have developed the world’s best-performing pure spin current source1 made of bismuth–antimony (BiSb) alloys, which they report as the best candidate for the first industrial application of topological insulators2. The achievement represents a big step forward in the development of spin-orbit torque magnetoresistive random-access memory (SOT-MRAM)3 devices with the potential to replace existing memory technologies. A research team led by Pham Nam Hai at the Department of Electrical and Electronic Engineering, Tokyo Institute of Technology (Tokyo Tech), has developed thin films of BiSb for a topological insulator that simultaneously achieves a colossal spin Hall effect4 and high electrical conductivity. The BiSb thin films achieve a colossal spin Hall angle of approximately 52, conductivity of 2.5 × 105 and spin Hall conductivity of 1.3×107 at room temperature. (See Table 1 for a performance summary, including all units.) 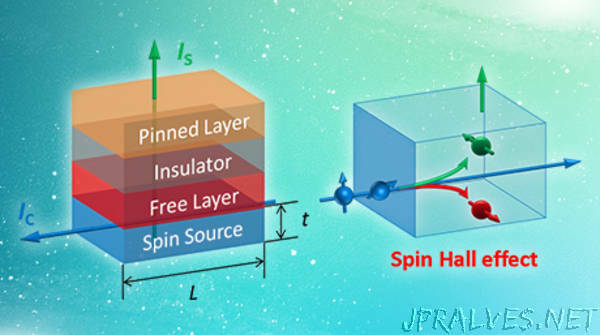 Notably, the spin Hall conductivity is two orders of magnitude greater than that of bismuth selenide (Bi2Se3), reported in Nature in 2014. The viability of such energy-efficient SOT-MRAMs has recently been demonstrated in experiments, albeit using heavy metals, conducted by IMECouter, the international R&D and innovation hub headquartered in Leuven, Belgium. The thin films were grown using a high-precision method called molecular beam epitaxy (MBE). The researchers discovered a particular surface orientation named BiSb(012), which is thought to be a key factor behind the large spin Hall effect. Pham points out that the number of Dirac cones6 on the BiSb(012) surface is another important factor, which his team is now investigating.